the necklace is so pretty!! so is the soft look of your outfit!! Lovely and adorable look! Nice colors and great accessories! Amazing look (like always! )...it's very feminine! I can't decide what piece I like most. Obsessed with the bow detail. very very pretty!!!! love this mix of colors! You're the most feminine woman I've ever seen on the web! So cute! I love the necklace and the bag! Such nice colors! 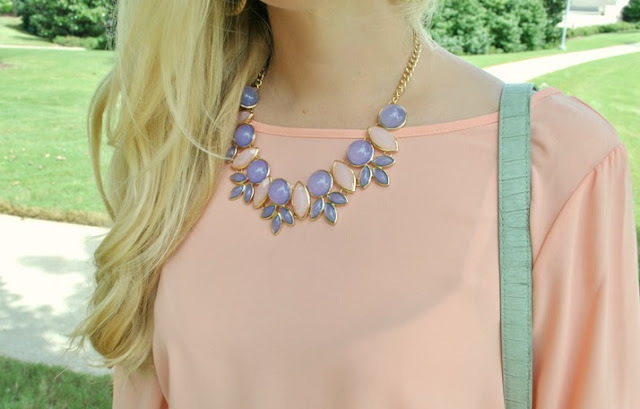 I just love the colors of this outfit, very cute, love pastel colors! This entire look is so precious! Love the bow and that skirt!! So pretty Anna! Love the skirt. Amazing and feminine look on you. This skirt style is so flattering on you. This outfit is so cute, I love the detail on the bakc, you look gorgeous! Love that skirt! Cute look. stunning bag and chic shoes!! love your blouse and the colors!! Love this outfit! The details on the blouse are so pretty! Really love the bow detail and pastel colors of the outfit! Love the top. Gorgeous and that skirt is too cute. I saw a girl wearing a top similar with a bow in the back and I thought it was absolutely gorgeous!! Adorable as always. Love this color palette. And the bow....so cute! You always have the cutest outfits! Love the skirt and the bow detail on the blouse! I adore that blouse and you styled it perfectly with that skirt! This outfit is so pretty! I love all of the colors together and the bow is so adorable. So pretty in pastel colours, that skirt is beyond pretty and feminine! This look is so pretty! I love the blouse and skirt together. Absolutely love this outfit with all the neutral/blush tones. One of my favorite color palettes to use. This look is so pretty and summery, love it! That bag is everything. Beautiful look. that is so cute, love bows!! Gorgeous. Ana, you rock pastel colors like no other. In love with that blouse too. Gorgeous top! I'm so obsessed with bows- this look is so pretty and feminine! such an adorable mix of colours. This outfit is so cute! I am in love with that skirt and the bow on the back of that top. LOVING the mint crocodile print bag!! I love the detail on your blouse! That's adorable and such a perfect detail to this look. Oooh, Anna, I'm in love with this outfit! These pastel colors look so pretty on you! Oooh these pastels are too beautiful together!!! You look absolutely gorgeous!!! Such a cute look! Loving your skirt! You really like them poufy skirts. You looks so elegant! That shirt is such a gorgeous color! You look darling in pastels! Love the bow accent and the ultra feminine look - tres chic! This is such a lovely outfit! The pastel color scheme is perfect. I love those soft colors! Lovely style. The blouse with the bow on the bag is so pretty. Love the colors too. Can you post more pictures with every post?